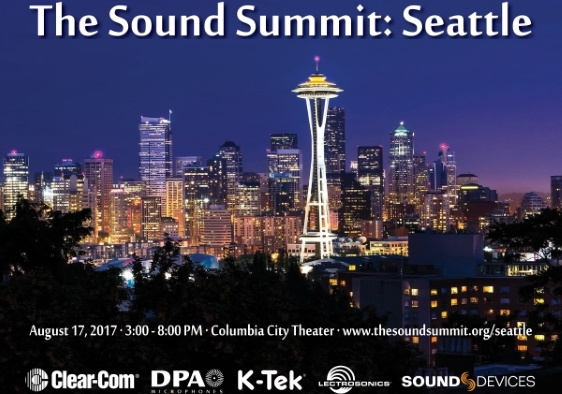 Seattle, Washington (July 10, 2017) — On Thursday, August 17, 2017, Clear-Com, DPA Microphones, Lectrosonics, Sound Devices, and K-Tek, will host The Sound Summit Seattle at the Columbia City Theater in Seattle. This event is part of The Sound Summit series of informal networking and educational presentations for audio professionals to gather, collaborate, and discuss their techniques and tools for audio production. With the cooperation of some of the industry’s most well-respected audio professionals, attendees will benefit from a one-on-one social experience with members of the community as well as these leading manufacturers who specialize in audio production. Clear-Com, DPA Microphones, Lectrosonics, Sound Devices, and K-Tek will also showcase their newest products, including Clear-Com’s FreeSpeak II wireless intercom system; DPA’s d:vice™ digital audio interface; Lectrosonics’ Duet Digital Wireless IEM/IFB Monitor system; Sound Devices’ MixPre-3 and MixPre-6 audio recorders; as well as K-Tek’s Boom Box microphone boom stand/apple box and the Sidekick KTA2B compact wireless transmitter adapter. The Sound Summit Seattle will be held from 3 p.m. to 8 p.m., opening with a networking social hour, followed by short informational presentations from each of the manufacturers from 4:00 p.m. to 5:30 p.m., dinner from 5:30 p.m. to 6:00 p.m., and concluding with a few additional hours of networking time. Representatives from all five manufacturers will be available throughout the event to discuss best practices for utilizing their equipment. The Columbia City Theater is located at: 4916 Rainier Ave. S., Seattle, WA 98118. Convenient parking for the event is located across the street, for $2. To sign up for this free event, please register at http://thesoundsummit.org/seattle/. Well respected within the film, broadcast, and theatre technical communities since 1971, Lectrosonics wireless microphone, IFB and IEM systems and audio processing products are used daily in mission-critical applications by audio engineers familiar with the company’s dedication to quality, customer service, and innovation. In 2017, Lectrosonics received an Academy Award® for technical achievement, for the development of the Digital Hybrid Wireless® technology. Lectrosonics is a vertically integrated US manufacturer based in Rio Rancho, New Mexico. Visit the company online at www.lectrosonics.com. Founded in 1998, Sound Devices designs and engineers premiere audio equipment used by sound professionals/enthusiasts around the world. The audio manufacturing pioneer, offers portable audio mixers/recorders – including the all-new MixPre Series – and related equipment for feature film, episodic television, documentary, news gathering, live-event, podcasting, SFX, musical and acoustical test and measurement applications. Sound Devices is headquartered in Reedsburg, Wisconsin with offices in Madison and Chicago. For more information, visit the Sound Devices website www.sounddevices.com.